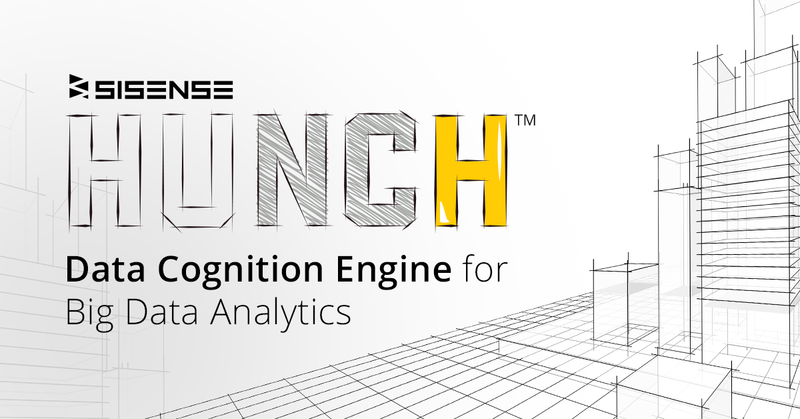 NEW YORK, NY October 23, 2018 –Sisense, disrupting the business intelligence (BI) market by simplifying business analytics for complex data, today announced the launch of the patent-pending Sisense Hunch Data Cognition Engine (“Sisense Hunch”) from Sisense Labs. Sisense Hunch ‘learns’ massive datasets and can produce microsecond analytical responses to queries that are 99 percent accurate or better, with a tiny fraction of the cost and storage footprint. Sisense Hunch represents a new class of big data analytics, data cognition engines, which can be applied to a number of revolutionary applications that were impossible due to latency and cost. Sisense Hunch puts the power of tens of billions of rows of data into a small, portable, cost-effective, and secure Internet of Things (IoT) package – effectively turning sensors, phones, and wearables into supercomputers. Sisense Hunch is currently in testing with multiple Sisense clients, and has been used to streamline efficiencies around quality control at a production facility of a publicly listed electronics manufacturer. Before Sisense Hunch, obtaining big data insights through high performance databases was slow and expensive, so they were off-limits to most business users and processes. With Sisense Hunch, massive stores of data are transformed into mere megabytes allowing for microsecond response times and the ability to be placed anywhere, even inside a tiny IoT device. The Big Data and Business Analytics Solutions market is forecasted to reach $260 billion by 2022 according to IDC. Sisense Hunch is positioned to disrupt this market making it possible to deliver the value of big data anywhere it is needed at a small fraction of the cost. Furthermore, Sisense Hunch offers significant benefits to securing information in massive databases. Sisense Hunch can be trained to ignore sensitive and personal information, giving organizations the benefit of big-data insights without the inherent security risks.